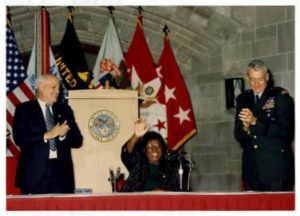 On October 5, 1995, three months before her death, former Congresswoman Barbara Jordan received the Sylvanus Thayer Award named in honor of Sylvanus Thayer, Class of 1808, who was the thirty-third graduate of the Academy and who nine years later became its fifth superintendent. The award is presented by the Association of Graduates of the United States Military Academy to an outstanding citizen of the United States whose service and accomplishments in the national interest exemplify personal devotion to the ideals expressed in the West Point motto, “Duty, Honor, Country.” Her acceptance speech appears below. To be chosen to receive the Sylvanus Thayer award is a personal tribute of high and unmatched quality. This single event places me among a group of distinguished Americans you believe best embodies the core principles of West Point. Duty. Honor. Country. My unequivocal delight is enhanced by your presence. Your decision to attend this institution was not a trivial one. You had to discard unnecessary irrelevancies and distracting engagements and commit yourselves to a path designed to add distinction to your country. I believe I am looking at an audience that includes future Thayer Award winners. By your desire to come to this place, by your admittance through a rigorous screening process, and by your work while here, you have already shown that you are the resource from which leaders will emerge. I know it must be difficult being a cadet. And I know as you sit here, with part of your attention focused on me and another part focused on the obligations of your cadet life, you are perhaps thinking that I am guilty of great understatement. Of course it is difficult being a cadet! I know through conversations with some of your predecessors and through anecdotes that filter through the press and other media- some true, some perhaps exaggerated-that yours is an education unlike any other. Demands are placed on you that cause shudders in most of your peers around the nation. It is difficult, as you try to live up to your own standards and those of the school, to consider the very important philosophical context of a West Point education. But it is important to take the time to examine your purpose and to understand that you are not here simply to get a degree. You could have done that anywhere. You are not here just to go through the motions and endure these West Point rites of passage. Duty. Honor. Country. What a marvelous resonance those words have. Indeed, hallowed words, as Douglas MacArthur called them in 1962. It is not just the sound of their syllables placed together that gives them resonance. It is their historical context. It is the assumptions that undergird those three words. Duty. Honor. Country. A host of tested and proven values are cast together in those six syllables. Can you do what is necessary through your service to your country to give those words a meaning that will not only suffice, but challenge and lead others in the twenty-first century-You must understand those words in order to allow your life to fulfill their meaning in depth and to expand that meaning through the service rendered. In the one hundred and ninety-three years of this institution, our famous warrior sons and daughters have come from West Point. These men and women who helped set your standards have led us in war and in peace. What set them apart from all others? Is it not the ability and the courage to deny one’s self? The ability to remain unswayed by unworthy motives and inconsequential reasons? Why are you here? I believe for one purpose that transcends all others. To serve your country. You made a decision with monumental consequences when you entered the United States Military Academy. If I were to look each of you in the eyes and ask why you came to West Point, I think you would agree that not every honest answer would place service of country at the top of the list. Some of you have more practical reasons for being here. Perhaps it was parental pressure. Perhaps it was the realization that you could not afford this level of education at any other school. Perhaps it was the desire to become the world’s premier engineer. Nothing is wrong with personal motivation. Nothing is wrong with understanding the worth of a West Point education. Certainly nothing is wrong with a desire to be the best. The key to your success at this institution, however, will be your ability to mature your personal motivation into a selfless motivation. The rewards for both you and the country will be far greater. Those of you who accomplish great things in service to your country will be those who learn the meaning of denial of self. Those of you who will accomplish great things will achieve the elevation of character that constitutes honor. You will be the decision makers of the future. You will literally hold the lives and fortunes of others within your power. It is my hope that your circumstances will not include warfare, but they very well may. If you do not develop honor, if you do not embrace the finest sense of justice that the human mind can frame, you will not be worthy of the confidence West Point and your country will place in you. How many times since you first stepped on this campus have you heard words to the effect that the role of the military is changing radically in these post-Cold War years? I hope you do not become numb to the meaning of the changing military role. Instead, take those words as compliments. For if your role were not changing, if you were not willing to change and shape change, then I suggest that you would not be of West Point caliber. Some things do not change. High ethical values inspirited by your principles. Duty. Honor. Country. They do not change. Your mission statement should be a constant inspiration to you. “Each graduate shall have the attributes essential to professional growth throughout a career as an officer of the regular Army,” it reads in part. Growth means change. Do not fear change. Embrace it as part of your mission. I am aware that tradition is important here. You are still being taught by some of the methods established by Sylvanus Thayer in the 1820S. Do not mistake adherence to successful tradition for a fear of change. One of your predecessors told me of the standing joke that West Point represents 193 years of tradition unhampered by progress. If tradition means a steadfast adherence to the highest ethical standards; if tradition means an unfailing dedication to your duty; if tradition means leadership with character; then let this tradition continue for the next 193 years. If you practice the highest ethical standards, if you are dedicated to your duty, and if you lead with character as Sylvanus Thayer taught, you will then be able to embrace change without fear. Tradition and change are not antithetical. If you look at those you have honored before me, you will see the embodiment of the weaving of tradition and the ability to embrace change. By enrolling in, and by now I hope embracing, the West Point tradition, you have accepted a lifetime of public service. You will be held–you should be held–to higher ethical standards than anyone else. By accepting a lifetime of public service you have also accepted the public trust. For 193 years, that public trust has been well placed. West Point is where leadership is born. West Point is not just famous names. It is men and women who achieve great things. It is people who built the east-west railroads, people who built the Panama Canal, people who have gone to the Moon. One hundred and ninety-three years ago we had just begun this grand experiment called democracy. We were not a mature nation. We were just beginning to define our character and find our footing as a country. Here-at West Point- the seeds were planted. The men and women of West Point watered our native soil. We have grown and excelled as a nation in no small part because of the work of your West Point family tree. Of course, you should not expect that by attending West Point or being graduated from here you will automatically achieve some form of immortality. Not every graduate does. Just as at every great educational institution, West Point has seen its share of graduates who have not lived up to the principles of duty, honor, and country. No system is perfect. After all, we are human. We have weaknesses and fears and misfortune. There is no magic formula to guarantee success. I can assure you that if you embrace your West Point heritage … if you go beyond the dictionary definitions of duty, honor, country and learn their meanings … if these words are inculcated into your very souls and are not just everyday chatter … you will not need magic formulas. Your West Point education is only the beginning. But a marvelous beginning. If the idea of service before self becomes ingrained in you–as West Point will give it every opportunity you will leave here with the necessary tools to lead our country in the twenty-first century. You will do so with honor. Max Sherman, ed., Barbara Jordan: Speaking the Truth with Eloquent Thunder (Austin: University of Texas Press, 2007), 83-87.